Ever drifted down a river only 20 feet before you had two shots and a mixed drink, lost your sunglasses, and swung on a 30 ft trapeze swing into the river? It caught us by surprise too. The 6km drift down the Nam Song River can easily become a drunken blur after visiting a few of the many bars lining its banks. The basic gist is: you’re floating along in your ancient innertube, a young Lao guy spots you coming and throws a bottle attached to a rope over your head. You grab on as he pulls you up to the bamboo platform and you promptly order a drink from the fully stocked bar. Since you’ve bought something, you’re now marked (with a string around your wrist, a marker scribble on your hand, or a painted fingernail), indicating that you now have access to the “play things” at each bar including trapeze swings, ziplines and slides. They all vary in size, length and legitimacy, but it’s all over water right? At each stop you can watch the bravery/drunkness escalate, but all in good fun. I preferred the trapeze swing, because you’re standing 60ft above the water, each foot on a plank with nothing beneath you. The swing is handed to you, and because it’s attached to 30ft of cable, its almost pulls you down. A few “What the @&#$ am I doing? !” mutters under the breath, plus a few seconds more of alcohol digestion and WHOOSH. Hold on for dear life. Then let go of course, but not too soon or late because landing on your face, stomach or back is not pleasant. AUSSIE AUSSIE AUSSIE! LET’S PARTY!! LET’S DRINK!! This was our first impression of the geographically stunning city of Vang Vieng; three drunken travelers, barefoot and bare-chested hopping on to our still-moving bus with the enthusiasm that only a great day of drinking on a river can inspire. 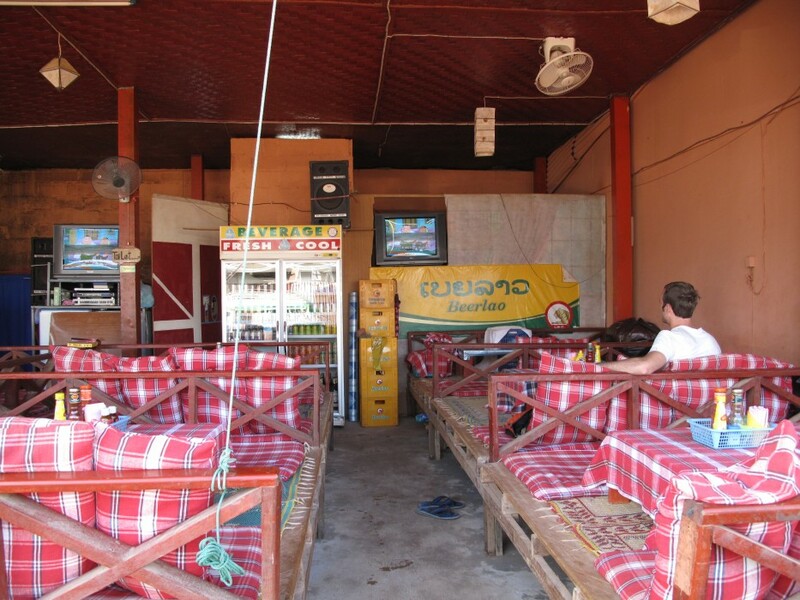 Made famous for tubing down a quiet little river flanked with limestone karsts rising straight up to the sky, Vang Vieng has nurtured this tourist attraction into a full fledged spring break subculture, growing makeshift bars and entertainment on the riverbanks. Travelers are delivered to the river by the bus load, and when a bunch of tourists are out drinking all day, at least a few of them are stumbing down the streets at night, and in this case, they are nearly naked with penises and other ridiculous scribbles drawn on them in permanent marker. With restaurants blasting back to back episodes of Friends and Family Guy, westerners filling the streets, every other shop selling souvenir shirts, bus tickets and tours, and loads of internet cafes, Vang Vieng is like a tourist trap time warp (TTTW for short). I’m not sure exactly where or when you are warped to, but it certainly doesn’t feel like Laos, and time definitely passes at a different pace. It’s all quite surreal, and after the initial shock of the place, we sank right into it. Rumor has it there’s a guy here that’s been tubing everyday for over a year. And man, I can see how it happens: It’s cheap here. The scenery is beautiful. The Lao people running this place are really friendly. The nightlife is great, the day time drinking even better. And after three days here, floating on the river and watching too many episodes of Family Guy, Nate and I realized that while it’s been great, WE HAVE TO GET OUT OF HERE. The real Laos is waiting for us somewhere.